This combination photo shows President Donald Trump speaking during a roundtable discussion in White Sulphur Springs, West Virginia, April 5, 2018, left, and former FBI director James Comey speaking during a Senate Intelligence Committee hearing on Capitol Hill in Washington on June 8, 2017. U.S. President Donald Trump said Thursday he did not fire Federal Bureau of Investigation Director James Comey because of the Russia investigation, contradicting previous statements that the probe was the reason for his dismissal. "Not that it matters but I never fired James Comey because of Russia!," Trump said in a posting on Twitter. He blamed the "Corrupt Mainstream Media" for promoting what he considers a false narrative about Comey's dismissal. In an interview last year with NBC TV news anchor Lester Holt, Trump said the Russia probe was foremost on his mind when he decided to fire Comey. "And in fact when I decided to just do it, I said to myself, I said 'you know, this Russia thing with Trump and Russia is a made-up story, it's an excuse by the Democrats for having lost an election that they should have won." Trump continues to be consumed by the investigation led by special counsel Robert Mueller, tweeting often that it is a "witch hunt," that there was no collusion between his campaign and Russia, and that he did not obstruct justice by firing Comey last year when he was heading the agency's Russia investigation. The U.S. Department of Justice reported Thursday that Mueller's investigation has spent $4.5 million on the probe over the past six months. More than half of that sum went to "personnel compensation and benefits," according to a five-page release by the department. 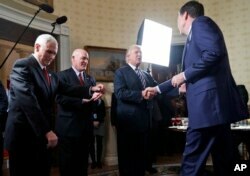 FILE - Pesident Donald Trump shakes hands with then-FBI Director James Comey in the Blue Room of the White House, in Washington, Jan. 22, 2017. But Trump vented his ire anew in a Twitter remark Wednesday after Republican Congressman Trey Gowdy said in a televised interview that Jeff Sessions did not tell Trump before he was named attorney general that he would remove himself from control of the Russia investigation. In a Fox News interview, Gowdy said, "I am even more convinced that the FBI did exactly what my fellow citizens would want them to do when they got the information they got, and that it has nothing to do with Donald Trump." Despite Gowdy's conclusion, White House spokeswoman Sarah Huckabee Sanders told reporters Wednesday that "certainly there's cause for concern" whether the FBI "acted appropriately" and that investigation of it ought to continue. Another longtime Trump defender, Fox News legal analyst Andrew Napolitano, said Trump's repeated claims that the FBI placed an undercover spy in his campaign "seem to be baseless." "There is no evidence for that whatsoever," Napolitano said. Earlier this month, Trump's lawyer, Rudolph Giuliani, added to the list of explanations Trump and his aides have cited for Comey's firing. Giuliani claimed Comey was dismissed because he would not say publicly that Trump was not being scrutinized in the probe at the time. Comey himself has said he was dismissed last May because of his handling of the Russia investigation.